The Panavia Tornado is a family of twin-engine combat aircraft, which was jointly developed by the United Kingdom, West Germany and Italy. There are three primary versions of the Tornado; the Tornado IDS (Interdictor/Strike) fighter-bomber, the suppression of enemy air defences Tornado ECR (Electronic Combat/ Reconnaissance) and the Tornado ADV (Air Defence Variant) interceptor. Developed and built by Panavia, a tri-national consortium consisting of British Aerospace (previously British Aircraft Corporation), MBB of West Germany, and Alenia Aeronautica of Italy, the Tornado first flew on 14 August, 1974, and saw action with the RAF, AMI (Italian Air Force) and Royal Saudi Air Force in the Gulf War. International co-operation continued after its entry into service within the Tri-National Tornado Training Establishment, a tri-nation training and evaluation unit operating from RAF Cottesmore, England. Including all variants, 992 aircraft were built for the three partner nations and Saudi Arabia. During the 1960s, aeronautical designers looked to variable geometry designs to gain the manoeuvrability and efficient cruise of straight wings with the speed of swept-wing designs. Britain and France initiated the AFVG (Anglo French Variable Geometry) project in 1965, which ended with French withdrawal in 1967. In 1968, West Germany, the Netherlands, Belgium, Italy, and Canada formed a working group to examine replacements for the F-104 Starfighter, initially called the Multi Role Aircraft (MRA), and later called the Multi Role Combat Aircraft (MRCA). Britain joined the MRCA group in 1968, represented by Air Vice-Marshal Michael Giddings, and a memorandum of agreement was drafted between Britain, West Germany, and Italy. The programme was intended to produce a single-seat replacement for the F-104G, and a two-seat strike fighter for Britain and West Germany. Canada and Belgium pulled out in 1969. The four remaining partner nations - United Kingdom, Germany, Italy, and the Netherlands, formed Panavia Aircraft GmbH on 26 March 1969, though the Netherlands pulled out in 1970. The United Kingdom and West Germany each had a 42.5% stake, with the remaining 15% going to Italy. The scope of work for production was also agreed upon - the front fuselage and tail assembly in the United Kingdom, the centre fuselage in West Germany, and the wings in Italy. A separate multinational company, Turbo Union, was formed in June 1970 to develop and build the RB199 engines for the aircraft, with ownership similarly split 40% Rolls-Royce, 40% MTU, and 20% FIAT. At the conclusion of the project definition phase in May 1970, the concepts were reduced to two designs; a single seat Panavia 100 which West Germany initially preferred, and the twin seat Panavia 200 which the RAF preferred and which would become the Tornado. In September 1971 the three governments signed an Intention to Proceed (ITP) document. At this point, the aircraft was intended solely for the low-level strike mission, where it was viewed as a viable threat to Soviet defenses in that role. The RAF decided it needed an air defence fighter, and initiated the development of the Tornado ADV. 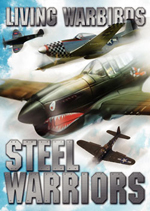 In 1976 Soviet espionage efforts upon the developing fighter were uncovered. The contract for the Batch 1 aircraft was signed on 29 July 1976. In 1979 Britain was considering replacing its Polaris submarines with Trident-equipped submarines, or alternatively using the Tornado as the main bearer of its nuclear deterrent instead. The first aircraft were delivered to the RAF and Luftwaffe on 5 June and 6 June, 1979 respectively. The first Italian Tornado was delivered on 25 September 1981. On 29 January 1981, the Tri-national Tornado Training Establishment (TTTE) officially opened at RAF Cottesmore. The Tornado was designed as a low-level supersonic ground attack bomber, capable of taking off and landing in short distances. This requires good high-speed and low-speed flying characteristics. 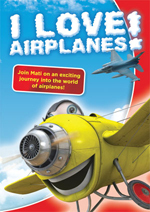 In general, an aircraft which is designed to fly at high speeds usually has poor low-speed characteristics. In order to achieve the desired high-speed performance, an aircraft has a highly swept or ‘delta’ wing platform. However, these wing designs are very inefficient at low speeds where unswept wing planforms are required. In order for an aircraft to be operated efficiently at both high and low speeds, variable wing sweep is a desirable feature; this was incorporated into the Tornado design. When the wings are swept back, the Tornado IDS increases its high-speed low-level capability by reducing drag. When sweeping, the wings partially slide into the fuselage, reducing the exposed wing area. This gives the aircraft a low gust response in turbulent low-level winds. This not only makes flight much more comfortable for the aircrew but also makes the aircraft a more stable platform from which to aim and deliver unguided weapons at low level. The aircraft was designed to be land-based and operate from large airfields that were considered to be vulnerable to aerial attack. Therefore, during the development of the aircraft, short field landing capability was considered essential in order to enable the aircraft to operate from short strips on potentially damaged runways and taxiways. With the wings swept fully forwards the Tornado IDS generates greater lift because of the increased exposed wing area and the use of full-span flaps and slats. This gives greater lift at lower speeds, reducing the minimum landing speed required and therefore giving shorter landing distances. Thrust reversers are also fitted to help in this respect, the Saab Viggen being the only other fighter aircraft to include this feature. The reversers contribute to the appearance of soot on the fin surface. The cockpit is of conventional design with a centre stick and left hand throttles. In general, when the pilot wants to fly at low speed, a cockpit selection lever is used to sweep the wings forward. This maximises lift. When flying faster the wings are swept further back. In flight the Tornado GR4 uses three sweep angles - 25, 45 and 67 degrees, with a corresponding speed range appropriate for each angle. The prototype model made its first flight on 14 August 1974 from Manching airbase in what was then West Germany. The first service delivery was made on 27 July 1979, with deliveries totalling 247 IDS variants, including 35 special ECRs. Originally the Tornados equipped five fighter-bomber wings, replacing the F-104 Starfighter. Two wings were disbanded in 2003 and 2005 and a third was reequipped with the Tornado ECR. When the last Tornado wing of the German Navy was disbanded in 2005, its Tornados formed a new reconnaissance wing in the Luftwaffe. German Tornados undertook NATO combat operations during the Bosnian War, the first combat operation for the Luftwaffe since World War II. British and Italian IDSs also participated. In 2007, a detachment of 6 Tornados of the Aufklx�rungsgeschwader 51 "Immelmann" (51st reconnaissance wing) deployed to Mazar-i-Sharif, Northern Afghanistan, to support NATO forces. Beginning in 2000, German IDS, ECR and RECCE(IDS with additional cables to support the RECCE-POD) Tornados received the ASSTA 1 upgrade. The major modification of the ASSTA 1 (Avionics System Software Tornado in Ada) upgrade was the replacement of the weapons computer with a MIL-STD 1553/1760 or Ada MIL-STD 1815 computer. 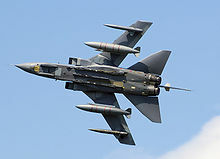 The Tornados also received an internal GPS, a Laser Inertial Navigation System, and the "Tornado Self Protection Jammer" ECM-pod. The new computer supports the HARM III, HARM 0 Block IV/V and Kormoran II missiles, the Rafael Litening II Laser Designator Pod and GBU-24 Paveway III laser-guided bombs. The ASSTA 2 upgrade began in 2005 only for the 85 ECR and RECCE Tornados, as the IDS is in the process of being replaced by the Eurofighter Typhoon. It mainly consists of digital avionics, a new ECM suite and provision for the Taurus cruise missile. In addition to the order made by the Luftwaffe, the German Navy's Marineflieger also received 112 IDS variants . These equipped two wings until 1994, when one was disbanded. The second was disbanded in 2005 with its aircraft and duties passed on to the Luftwaffe. The first Italian prototype made its maiden flight on 5 December, 1975 from Turin, Italy. The Aeronautica Militare received 100 Tornado IDS (15 were later converted to ECR configuration). They took part in the first Gulf War in 1991, losing one plane to AAA, and in Kosovo in 1999, with the IDS in the bombing role and the ECR for suppression of enemy anti-aircraft radars (firing 115 HARM missiles). There is an ongoing Italian programme to improve the Tornado's capabilities. 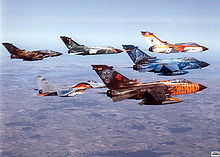 For ten years the Italian Air force used 24 Tornado ADVs, leased from the Royal Air Force as stop-gap between the retirement of the F-104 Starfighter and the introduction of the Eurofighter. It is planned to replace the Tornado IDS/ECR fleet in Italian service with the F-35 Lightning II. The first British prototype made its maiden flight on 30 October, 1974. On 11 July, 1985, the RAF reconnaissance version (GR1A) made its maiden flight. RAF Tornado GR1s and GR1As were used during the Gulf War, Operation Desert Fox and the Kosovo War. The Tornado's combat debut came in 1991 in the Gulf War. Nearly 60 GR1s were deployed by the United Kingdom to air bases at Muharraq (Bahrain), Tabuk and Dhahran in Saudi Arabia. In the early stages of Operation Granby RAF Tornado GR.1s were used to target Iraqi military airfields using 1,000 lb (450 kg) unguided bombs in loft-bombing attacks and the JP233 runway denial weapon. Six RAF Tornados were lost, as was one Italian Tornado. Of the RAF aircraft, four were lost while delivering unguided bombs, one was lost after delivering JP233, and one was lost trying to deliver laser-guided bombs. For the Gulf War (Operation Granby), the ALARM missile and TIALD pod were rushed into service for RAF IDSs. Seven RAF aircraft were lost during the conflict. Three were shot down in combat, three crashed on operations and one was lost in a non-combat incident. Laser guided bombing was introduced at Muharraq on 2 February using Blackburn Buccaneers as airborne designators. Over 1500 bombing sorties and 100 JP233 sorties were flown by RAF Tornados during the Gulf War. On 17 January 1991, a Tornado was shot down by an Iraqi SA-16 missile after a failed bombing run. On 19 January, a second RAF Tornado was shot by a short range SAM or MANPADS during a raid on Tallil Air Base. On 14 February a third RAF Tornado was downed by radar guided SAMs, either SA-2 or SA-3. It has been claimed that a Tornado (ZA467) crewed by Gary Lennox and Adrian Weeks was shot down on 19 January by an Iraqi MiG-29 piloted by Jameel Sayhood with a R-60MK missile, however this aircraft is recorded as having crashed on 22 January on a mission to Ar Rutbah. Following the end of the initial phase of the war, the GR.1s were switched to medium level strike missions. In an emergency deployment, the UK sent out a detachment of Blackburn Buccaneer aircraft equipped with the Pave Spike laser designator, allowing the GR.1s to drop precision guided weapons. A further crash programme was initiated which saw some GR.1s fitted with the TIALD system. In the aftermath of the war, British forces remained in the Gulf, with GR1s being based at Ali Al Salem airbase in Kuwait for operations over the southern no fly zone. GR.1s based there took part in Operation Desert Fox in 1998. On 14 February 1994, the RAF received the first GR.1B maritime strike aircraft. Picture - A Tornado GR1 of XV Sqn RAF. As early as May 1984 the UK Ministry of Defence began studies for the first Tornado upgrade project, but the project stalled. In March 1993 a new Mid-Life Upgrade (MLU) project was launched. On 29 May, the first GR4 development aircraft made its maiden flight. On 29 July 1994 the UK signed a contract for MLU of GR1/GR1A/GR1Bs to GR4/GR4A standard. The first flight of an upgraded GR4 was on 4 April 1997, with the first delivery to the RAF on 31 October. The GR4 entered front line service on 28 April, 1998. The Tornado GR4 made its operational debut in patrols during Operation Southern Watch. The aircraft flew from Ali Al Salem in Kuwait, and patrolled a large part of southern Iraq. Several times bombs were dropped when the aircraft were fired upon by Iraqi ground defences. 1999 saw further action for the GR1 in the Kosovo War. Aircraft operated from RAF Bruggen in Germany during the first part of the war, flying precision strike missions. They later moved to a base on Corsica shortly before the war ended to bring them closer to the combat zone. Following the Kosovo War, the GR1 was phased out as more and more aircraft were upgraded to the GR4 standard. The final GR1 was upgraded in 2003 and returned to the RAF on 10 June. The GR4 version's full wartime debut came in Operation Telic, the British part of the invasion of Iraq in 2003. The campaign in Iraq marked a number of firsts for the aircraft. No. 617 Squadron used the Storm Shadow Missile for the first time, and enhanced Paveway smart bombs were used to attack runways. On 23 March 2003, a Tornado GR4 was lost to friendly fire when it was engaged and shot down by a U.S. Patriot missile battery. Both crew members were killed. In early 2009, Tornado GR4s replaced the detachment of Harrier GR7/9 ground-attack aircraft that was based at Afghanistan’s Kandahar airfield since November 2004. On 25 September 1985, UK and Saudi Arabia signed the Al Yamamah I contract including, amongst other things, the sale of 48 IDS and 24 ADV model Tornados. The first flight of a RSAF Tornado IDS was on 26 March 1986, and the first Saudi ADV was delivered on 9 February 1989. Saudi Tornados undertook operations during the Gulf War. In June 1993 the Al Yamamah II contract was signed, the main element of which was 48 additional IDSs. In September 2006 the Saudi government signed a contract worth �2.5 billion ($4.7 billion) with BAE Systems to upgrade possibly 80 aircraft in the Saudi Air Force fleet which it wants to keep until 2020. RSAF Tornado 6612 returned to BAE Systems Warton in December 2006 for upgrade under the "Tornado Sustainment Programme" (TSP), which will "equip the IDS fleet with a range of new precision-guided weapons and enhanced targeting equipment, in many cases common with those systems already fielded by the UK Royal Air Force's Tornado GR4s." In December 2007 the aircraft, "believed to be the first RSAF aircraft to complete modernisation", was returned to Saudi Arabia. Starting from the first week of November 2009, Saudi Air Force Tornados, along with Saudi F-15s performed air raids over Yemeni Houthis rebels in Yemeni Norther region of Sa'dah. It was the first time since Operation Desert Storm in 1991 that Saudi Air Force took active party in a military operation over hostile territory. The Tornado is cleared to carry almost all the air-launched weapons in the NATO inventory, including cluster bombs, anti-runway munitions, and nuclear weapons. Ground attack aircraft also have a limited air-to-air capability with Sidewinder or ASRAAM AAMs, and the ADV variant can lauch long range AAMs such as AMRAAM. RAF IDS variants were initially designated the Tornado GR1 with later modified aircraft designated Tornado GR1A, Tornado GR1B, Tornado GR4 and Tornado GR4A. The GR1 was delivered in a dark sea-grey/dark-green wraparound camouflage, but this was changed to dark grey during the late 1990s. In operations over Iraq some GR1s received a sandy "pink" scheme. GR4s participating in the 2003 Iraq War were painted in a light grey scheme. German Navy examples normally sported a distinctive black/blue/gunmetal grey camouflage pattern. The RAF Tornado GR1 was the first generation version of the Panavia Tornado strike aircraft of the Royal Air Force. The first of 228 GR1s was delivered on 5 June 1979, and the type entered service in the early 1980s. 142 aircraft were upgraded to GR4 standard from 1997 to 2002, after which time the GR.1 designation was abandoned. The Tornado was designed for ultra-low-level penetration strikes on Warsaw Pact targets in Europe using both conventional and tactical nuclear weapons, e.g. WE.177. A major feature of the GR.1 was its terrain-following radar, which allowed all-weather hands-off low-level flight, but current doctrine eschews extreme low-level flight and relies on inertial navigation with GPS updates rather than TFS. The RAF Tornado IDS aircraft have a Laser Range Finder and Marked Target Seeker (LRMTS) under the fuselage on the starboard side, just forward of the nose landing gear in an aerodynamic fairing. This system consists of a laser that can be used to measure the slant range of a point on the ground relative to the aircraft. This information is then used by the aircraft's avionics to compute targeting information for the crew. The LRMTS laser sensor can also be used to receive reflected laser energy from a third-party laser, allowing the crew to find targets that have been marked by troops on the ground or another aircraft. The laser cannot be used for guiding laser-guided bombs. IDS aircraft supplied to Italy, West Germany and the Tri-National Tornado Training Establishment do not have the LRMTS system, but the aircraft supplied to the Royal Saudi Air Force do. The Tornado GR1B was a specialised anti-shipping variant of the RAF Tornado GR1. Based in Scotland at RAF Lossiemouth, they replaced the Blackburn Buccaneer in the anti-shipping role, delivering the Sea Eagle anti-ship missile. It did not have the ability to track shipping with its radar and relied on the missile's seeker for target acquisition. When the Tornado GR1 strike aircraft of the Royal Air Force were updated to the GR4 standard in the late 1990s there was no corresponding GR4B version of the GR4. It was judged that a specialised anti-shipping variant of the aircraft was no longer needed as the threat from surface warships the GR1B was designed to operate against had decreased, and also because the Sea Eagle missile was coming towards the end of its shelf-life and there were no plans to replace it due to the cost of doing so. Picture - RAF Tornado GR4 during Operation Telic. In 1984 the UK Ministry of Defence began studies of a Mid-Life Update (MLU) of the aircraft to rectify shortcomings of the GR1. This update, to Tornado GR4 standard would improve capability in the medium level role while maintaining the Tornado's exceptional low-level penetration capability. The GR4 upgrade was approved in 1994, after it had been revised to include lessons learned from the GR1's performance in the 1991 Gulf War. One major change was the move from low level penetration to medium level attacks, while maintaining the low level capability. The contracts were signed with British Aerospace (later BAE Systems) in 1994 for the upgrade of 142 GR1s to GR4 standard, work began in 1996 and was finished in 2003. Upgrades to the more than twenty-year old aircraft included FLIR (Forward-Looking InfraRed), a wide-angle HUD (Heads-Up Display), improved cockpit displays, NVG (Night Vision Goggles) capabilities, new avionics and weapons systems, updated computer systems, and a Global Positioning System receiver. The updated weapons system allowed integration of the latest offensive weapons, for example the Storm Shadow and Brimstone missiles and reconnaissance equipment such as the RAPTOR pod. As of late 2006, the GR4 fleet is being fitted with a new 12.8-inch Multi-function display in the rear cockpit to replace the circular Combined Radar and Projected Map Display (CRPMD): The BAE Systems Tornado Advanced Radar Display Information System (TARDIS) is an Active-matrix liquid crystal display. TARDIS is currently being fitted to aircraft of the Fast Jet and Weapons Operational Evaluation Unit (No. 41 Squadron RAF), before being fitted to all GR4 aircraft. The TIRRS system was designed and implemented during the Cold War era, and was designed for use in theatres of operation where low and fast flying was the norm. As such, the system is of limited use at medium to high altitudes. The RAF ordered 30 GR1A airframes, either as rebuilds of GR1's or as new airframes, and 25 aircraft were upgraded to GR4A standard. The GR4A retains almost all of the offensive capabilities of the GR4. As RAPTOR becomes the principal reconnaissance sensor of Tornado in RAF service, TIRRS will be phased out. To this end, the RAF's Tactical Reconnaissance Wing at RAF Marham which comprises II Squadron and 13 Squadron now fly both GR4A and GR4 variants, since the sensors specific to the GR4A are no longer essential to the reconnaissance role. 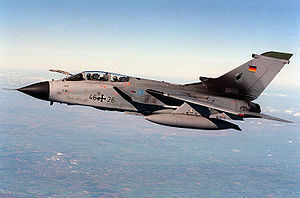 The German Air Force (Luftwaffe) received 212 Tornado IDSs. On 13 January 2004, the then German Defence Minister Peter Struck announced major changes to the German armed forces. A major part of this announcement is the plan to cut the German fighter fleet from 426 in early 2004 to 265 by 2015. Assuming the full German order for 180 Eurofighter Typhoons is fulfilled, this will see the Tornado force reduced to 85. The Italian Air Force (Aeronautica Militare Italiana) received 100 Tornado IDS. 57 were operational in July 2004. In July 2002 Italy signed a contract with NATO Eurofighter and Tornado Management Agency (NETMA) and the Panavia partner companies for the initial upgrade of 18 IDSs. Alenia Aeronautica is responsible for the upgrade, the first of which was completed in November 2003. The first phase of the upgrade will see a modernised avionics suite, new digital radios, a SATCOM capability and new weapons capabilities for the carriage of Joint Direct Attack Munitions, Raytheon Enhanced Paveway III laser guided bombs and the MBDA Storm Shadow. A further upgrade is being developed by Alenia which will improve mission capabilities, a new Defence Aids Sub-System (DASS) and a MIDS communications capability. The decision of whether or not to upgrade the whole fleet will follow, as the purchase of 109 F-35 Lightning II fighters has been decided by the Italian government to replace the Tornado. Operated by Germany and Italy, the ECR is an Tornado variant devoted to SEAD missions. It was first delivered on 21 May 1990. The ECR is equipped with an emitter-locator system (ELS) which is designed to locate enemy radar sites and armed with the AGM-88 HARM. The Luftwaffe's 35 ECRs were delivered new, while Italy received 16 converted IDSs. German ECRs were equipped with a Honeywell infra-red imaging systems for reconnaissance, however operational experience lead to the removal of this system; It was considered impractical for one aircraft to be tasked with both SEAD and reconnaissance. 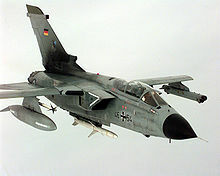 German ECR Tornado's participated successfully during Operation Allied Force in former Yugoslavia and launched a total number of 236 AGM-88 HARMs. The German ECR Tornados do not carry a Gun. Italian ECRs (IT-ECR) differ from the Luftwaffe aircraft in that they were never equipped with a reconnaissance capability and as IDS conversion they are equipped with RB199 Mk.103 engines. Luftwaffe ECRs are equipped with RB199 Mk.105 which have a slightly higher thrust rating. The first IT-ECR was delivered on 27 February 1998, and formally accepted on 7 April. The RAF and RSAF IDS carry ALARM missiles in this role. The Tornado ADV is a fighter variant of the Tornado, developed for the RAF (known in service as the Tornado F.2 or F.3) and also operated by Saudi Arabia and Italy. XX946 Tornado Prototype P02 on display at the RAF Museum Cosford, England. XX947 Tornado Prototype P03 on display at Shoreham Airport, England. XZ631 Tornado GR1 on display at Yorkshire Air Museum, Elvington, England. ZA319 Tornado GR1T Gate Guard, MoD DSDA, Bicester, England. ZA457 Tornado GR1 on display at RAF Museum, Hendon, England. Scutts, Jerry (2000). Postwar Aircraft. Osprey Publishing. ISBN 9781841761596. Taylor, Michael J.H. (2001). 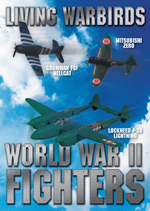 Flight International World Aircraft & Systems Directory (3rd Edition ed.). United Kingdom: Reed Business Information. 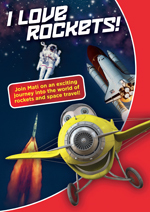 ISBN 061701289X.